Our Apartment Tirol (4*): located on the ground floor, separate entrance area, wardrobe, spacious, comprised of 3 rooms (70 sq. meters), for up to 4 people, an extra child's bed possible (extra charge). If requested, we can also offer a baby cot and child’s/baby seat (free of charge). Our Apartment Tirol (****S) is located on the ground floor. It has its own dedicated entrance area including a wardrobe. The apartment is spacious and comprised of 3 rooms (70 sq. metres) for up to 4 people with the option of adding an extra child's bed making it 5 (the extra charge for the additional bed varies depending on the respective booking period). If requested, we can also offer a baby cot and child’s/baby seat (free of charge). Our Apartment Tirol is cosy, comfortable and nicely furnished with a fully equipped open-plan kitchen (including dishwasher, fridge with freezer compartment, a 4 hob electric oven, kettle, filter coffee machine, toaster etc.). The apartment has under floor heating, a large and bright living / dining area, 1 double bedroom with bath and shower (en-suite), 1 double bedroom with two single beds (if requested, the extra child’s bed can be placed between the two single beds); separate WC; storage room. The apartment has direct access to the large garden and terrace with garden furniture and sun beds (for your own use only) with an amazing panoramic view on the surrounding valley- and mountain landscape. The facilities include opportunities for barbecue, table tennis and a child's sandbox, SAT-TV (Full-HD), free Internet/W-LAN, non-smoking apartment. Dogs allowed only on request prior to booking. sehr schöne saubere Ferienwohnung. Nicht weit von Hochfügen und Spieljoch entfernt. Schön ruhig gelegen. Nur der Bäcker macht erst um 7:30 Uhr auf aber da kann ja die Wohnung nichts für. die Wohnung ist sehr gut ausgestattet. Es fehlte uns nur an einem Fön. Aber den bringen wird dann das nächste mal mit. Wir verbrachten in diesem Winter schon zum zweiten mal einen wunderschönen erholsamen Urlaub in der Ferienwohnung. Alles war super. Die Wohnung ist sehr gut gelegen, sehr sauber und mit allem ausgestattet, was man für einen entspannten Urlaub benötigt. Unsere Kinder haben sich ebenso wohl gefühlt, wie wir und unser Hund. Der Vermieter ist sehr nett und wir kommen auf jeden Fall wieder. Die Fewo ist sehr schön gelegen, ruhig und doch zentral. Alles sehr sauber und gepflegt, die Küche sehr gut ausgestattet. Supermarkt in der Nähe, sowie ein sehr gutes Restaurant in 500m Entfernung. Der Vermieter hat uns sehr nett empfangen und betreut, gab uns tolle Tipps für Wanderungen. Die Erlebnistherme Zillertal ist nicht nur für Kinder eine Attraktion. Wir haben uns sehr wohl gefühlt... wir kommen nächstes Jahr gerne wieder. Die Wohnung ist gemütlich und gleichzeitig modern eingerichtet. Große Außenterrasse, schöner Ausblick. Durch den separaten Eingang ist man völlig für sich. Der Vermieter war sehr freundlich. Das Skigebiet war top, Supermarkt und Bäcker sind zu Fuß zu erreichen. Sehr gutes, rustikales Restaurant 500m entfernt. Wir waren das erste Mal in Tirol zum Skifahren und waren begeistert! Our rural holiday home Apart Fucona with our Apartment Tirol is situated about halfway between Innsbruck and Kufstein. From the Zillertal motorway exit Fügen/Fügenberg lies approximately 8km away in the direction of Mayrhofen. • either - take the Inn Valley toll motorway in the direction of Innsbruck and come off at the Zillertal exit. Drive through the Brettfall tunnel and stay on the Zillertalstraβe B169 into the valley. • or – take the toll-free country road from Tegernsee,driving over the Achenpass (B181 – Achenwald, Achenkirch). Drive through the Brettfall tunnel and continue further on the Zillertalstraβe B169 into the valley. Then - pass the “Wilkommen Fügen” exit and continue along the Zillertalstraβe B169, coming off at the “Fügenberg/Pankrazberg/Hochfuegen-Spieljoch” exit. At the roundabout take the first exit and after about 0.1km (100yds) go straight ahead at the next roundabout. Climbing steadily, continue on Pankrazbergstraβe for about 0.5km (1/4 ml), turning left at the crossroads by the Hotel Alpina situated on the right. After travelling along the St.Pankraz-Weg for about 1km (1/2 ml), having passed several farms, St.Pankraz church will be seen ahead. After a further 200mtrs you will reach three houses on the left. Apart Fucona is the middle of these three properties. 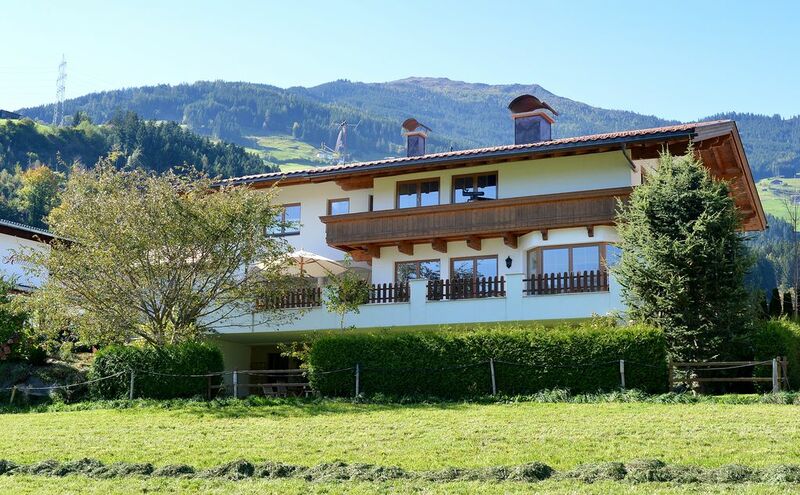 Our rural holiday home Apart Fucona with the Apartment Tirol lies above Fügen in the Zillertal, approximately 620 metres above sea level. It is surrounded by the Zillertal Alps where there are many mountain lodges and huts nestled in Alpine pastures. The area is ideal for all sorts of sport activities. In Summer - mountain hiking, cycling tours, mountain biking, leisurely strolls in beautiful surroundings and summer-sledging. In Winter – skiing, boarding or cross-country skiing in the top ski resorts nearby.(www.best-of-zillertal.at/winter). 1. Ski-boarding and cross country skiing activities in the Winter and superb hiking and cycling tours in the Summer are nearby and are accessible by modern cable car and lifts. These facilities are surrounded by an amazing panorama of quaint valleys and rugged 3000mtr mountain peaks. Furthermore, mountain lodges and huts offer culinary delights and award-winning cuisine. - i.e.Landgasthof Linde, Stumm (www.landgasthof-linde.at), Der Metzgerwirt, Uderns (www.dermetzgerwirt.at) , Gasthof Herrenhaus, Brixlegg (www.herrnhaus.at), Kristalhütte, Kaltenbach (2150m above sea level) (www.kristalhuette.at) or Wedelhütte, Kaltenbach (2350m above sea level) (www.wedelhuette.at). 2. Pleasurable lift rides up the mountain in fantastic skiing or hiking resorts – you will find what you are looking for! As a beginner or as a ski/hiking enthusiast or even as a professional you just make your own choice: Spieljoch (www.spieljochbahn.at), Hochzillertal - Hochfügen/Kaltenbach (www. ski-optimal.at/www.hochfuegenski.com), Zillertal Arena - Gerlos (www.zillertalarena.com), Mayrhofen (www.mayrhofener-bergbahnen.com), Hintertuxer Gletscher (www.hintertuxergletscher.at). 1. The Thermal Spa (“Erlebnistherme Zillertal) with open-air pools, long water slides and wellness and sauna areas for relaxtion. (www.erlebnistherme-zillertal.at). 2. The Golf Club in Uderns has an 18 whole champion's course, driving range and golf academy (www.golf-zillertal.at). 6. Experiencing ancient customs and traditions like Tyrolean folk theatre, the Autumn livestock festival (“Almabtrieb”).